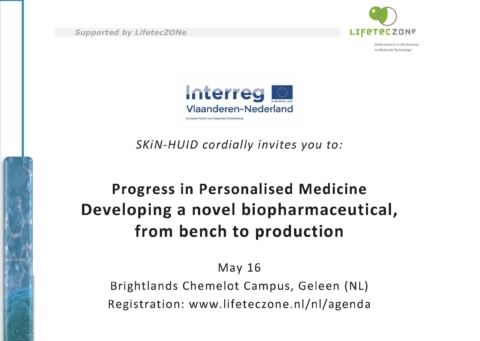 Symposium "Progress in Personalised Medicine Developing a novel biopharmaceutical, from bench to production"
Binnen het project SKiN-HUID wordt een nieuwe behandeling van huidkanker ontwikkelt, die de doeltreffendheid van farmaceutische medicijnen versterkt door de elektrische en hyperthermische stimulatie van de kankercellen. De bijeenkomst richt zich voornamelijk op bedrijven, die actief zijn in de biotechnologie, productie van farmaceutische en medische apparatuur en start-up support. 13.20 SKiN-HUID, a Euregional collaboration between Industry and Universities to improve the treatment of skin cancer. 13.35 Melanoma Patient-Derived Tumor Xenografts in mice as preclinical models to understand carcinogenesis and to predict efficacy of novel anticancer drugs. 13.55 The role of pathology in translating experimental treatments from the preclinic to clinical application. 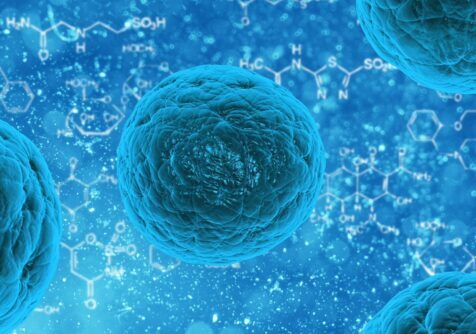 14.20 GMP-production of biologicals for the first-in-man clinical study. Ralph Bosmans, Basic Pharma Technologies B.V.
Jacques Havermans, Interdos Pharma B.V.